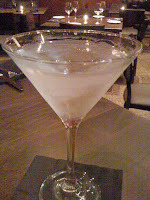 I had the pleasure of dining at the brand new Naya Bistro & Lounge in Highland Heights last night. I'd scoped out the restaurant (I work down the street) and the menu ahead of time online and wasn't sure what to expect, based on the strip mall locale, but I was pleasantly surprised at how amazing my meal was. There were multiple vegetarian options for me to choose from, too...always an added bonus! 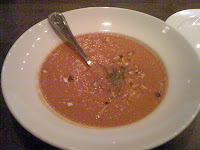 I followed that up with the roasted tomato soup($5). Vegetarian and delicious. (any restaurant that serves a vegetarian soup gets bonus points in my book!) It had a little bit of a kick to it, so it wasn't your typical tomato bisque. 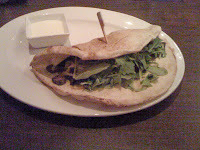 For my entree, I tried the braised wild mushroom pita ($10). I've had many mushroom and/or pita dishes in my day, but I can honestly say this was the best mushroom sandwich I've ever eaten. Hands down. The mushrooms were flavorful and the creme fraiche that came as an accompaniment added a nice garlicky flavor to the sandwich. 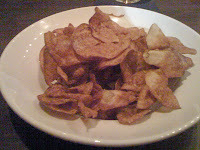 As an added bonus, homemade salt and vinegar chips came on the side. They were fresh and salty and amazing. My meat-a-tarian boyfriend had the soup of the day - a beef and black bean chili - and the seafood stew entree and really enjoyed both dishes. Collectively, we liked the atmosphere of the restaurant. It feels upscale, despite having a decent sized bar area with a mammoth tv. The prices may be a bit steep for the neighborhood, but for the quality of food, it's well worth it. Kudos to the staff for asking for frequent feedback, too. They've only been open for less than a week but are asking patrons to let them know what could be done better. I honestly had no feedback. There were plenty of vegetarian friendly options...the service was good (our waiter answered soo many questions for me - a girl's gotta make sure dishes are vegetarian! )...and best of all, the food was fantastic. From what I read on the restaurant's website, they hope to be a sustainable business using locally sourced ingredients. Cool, huh? I wish Naya Bistro & Lounge nothing but success. I can't wait to go back and try some of the other vegetarian options! If you live in the area and have a couple extra bucks to spare for a nice evening out, definitely give this place a try. Worst case scenario, if you don't like your meal, you can go to the Qdoba or Panera next door!